This registration type is for people who want to enter a vehicle in to the Southwest MOPAR Mini-Nationals show and have the vehicle participate in the Judging process. All vehicles to be judged must be in the proper body groups area (row). If a vehicle is not in the correct area it will not be judged. ** All pre-registered entries of this type will receive a complimentary event tee-shirt. This registration type is for people who want to enter a vehicle in to the Southwest MOPAR Mini-Nationals show and will not have the vehicle participate in the Judging process. It would be preferred that this entry type parks with other body types but it is not required. This registration type is for people who want to register for a swap space in the Southwest MOPAR Mini-Nationals show. 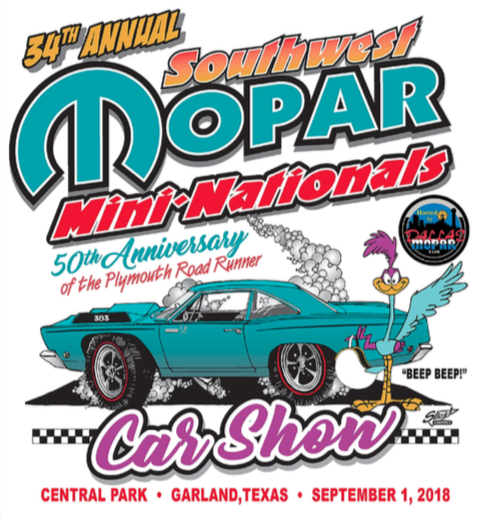 Come join the Dallas MOPAR Club as it hosts the 34th annual Southwest MOPAR Mini-Nationals car show. We will have judged classes for all MOPARs with a non-judged car corral, swap meet spaces, parts vendors, food, and door prizes.